Freshmen Jeff Engle conducted summer research with Dr. Peter Gonthier before ever taking his first official Hope class. 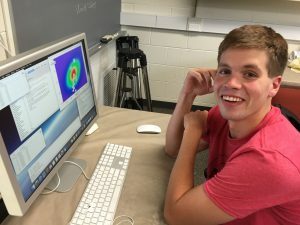 Here in a Hope lab, he worked on testing new techniques for implementing kernel density estimations in pulsar simulations. 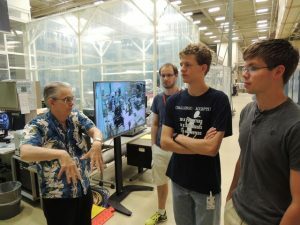 Dr. David Thompson, far left, is the Fermi Deputy Project Scientist and LAT Instrument Multiwavelength Coordinator at the Goddard Space Flight Center. Here he instructs, from left to right, Jesse Ickes, Josiah Brouwer, and Jeff Engle. Engle spent his pre-freshman summer in the physics department’s Research Bridge Program as part of the department’s philosophy that students should “learn physics by doing physics.” Before ever setting foot in his first Hope College class, Engle worked with two upperclassmen, Jesse Ickes ’16 and sophomore Josiah Brouwer, on pulsar star research with Gonthier at Goddard and at Hope. Engle jumped into his first Hope research experience “kind of blindfolded because I’d never done anything like that before,” he admits. He found Gonthier and his fellow Hope students encouraging and supportive. “I was a little nervous because I was going to be working around well-known scientists (at Goddard).” But he embraced the experience nonetheless. 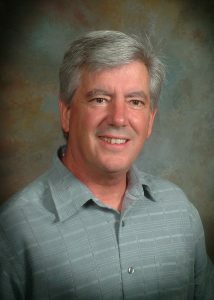 Gonthier has conducted research at Goddard for the past 24 summers, most years taking Hope students along with support from grant funding. His work in theoretical physics is helping to develop and test realistic descriptions of pulsars’ magnetospheres, important for the understanding of how neutron stars are able to produce radio and high-energy radiation pattern. His team worked last summer in the Goddard office of Nobel Laureate John Mather. “It was definitely humbling to meet him and work in his office,” says Engle of cosmologist Mather, recipient of the 2006 Nobel Prize in physics for his work on the Cosmic Background Explorer Satellite with George Smoot. Engle isn’t sure what kind of scientist he wants to be at this point, but he knows one thing for sure: This early experience has helped him appreciate not only all that goes into conducting such complicated research but all that goes into this complicated universe. Ultimately, it even helped strengthen his Christian faith.